I recently visited Rotherham and found the facilities to be disgraceful. I was shocked to discover that the ground served no beer, had no betting booths and had a shed for a stand. When you sit down you had no leg room what so ever, especially if you have long legs. The toilets were of a fairly high standard though, they were fairly clean and spacious. The food was also poor, as the pie that I brought was more or less cold, and they ran out of food fairly quickly. I would recommend eating just outside the ground, from the very few burger bars around. I suppose the pricing was pretty reasonable, the tickets were £16 per adult and £8 per child. Leave the M1 at junction 33 and take the A630 dual carriageway towards Rotherham. At the first roundabout turn left, right at the next, then straight on at the third, and you will be able to see the floodlights to your left. The official 'away' fans car park is at the Zone nightclub. This is located on the other side of the dual carriageway, so go around the roundabout, and back along the dual carriageway. The Zone night club is located on the left hand side. 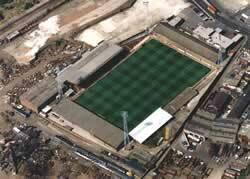 Millmoor is about a five minute walk from the railway station. On exiting the station go left over the bridge. Head towards the floodlights over (or under via subway) the dual carriageway, and up Masbrough Street. If you are a registered user then you can login, and create your own personal review of Rotherham United - Millmoor Ground. These reviews can be private or public.